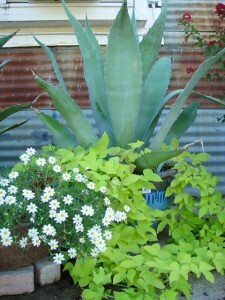 Containers have the same principals as landscape; the right plant in the right place. Is it sized for the plant to contentedly hold the plants you want to grow when they are full grown. Canna in an 8” pot is not cool, and won’t work, too top heavy! But we like to use Canna in pots, we control it’s invasive nature and they are spectacular show offs. Containers will use up lots material; typically plant large containers with about ½ to 2/3 drainage material and 1/3 soil. For small containers we fill to the top with soil leaving about 1.5” for watering from the top, and don’t forget the landscape fabric over the drain hole in the bottom, this will prevent spillage of soil and helps to prevent staining of the surface. The ability to maintain levels of even moisture throughout the pot is important to the plants health. We use our own custom blend of soils for the type of plants we use. We use a dry type of mix for succulents and a rich moisture holding mix of composts and mulches for flowering plants. Its important to fertilize potted plants. Where will the containers go? Pots on each side of an entry or a formal front porch may need to match color schemes of the building. Our old building is easy to match, the container plants do liven up the entry though! 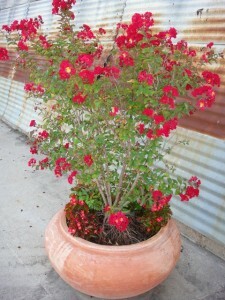 We like hardy plants in our beautiful containers and we start with a good design. For extravagant containers an evergreen with colorful flowing vinery and spots of annual color. Big-faced pansies mixed in cooler weather, and tiny violas with tough as nails Ligustrum ivy variegated make for an each change out to spring of new hotter weather annuals. Ginger when it’s hot, Bougainvillea, Castor Iron plant, Ferns, Leopard plants, Helliborus, ok, we’re stopping here. 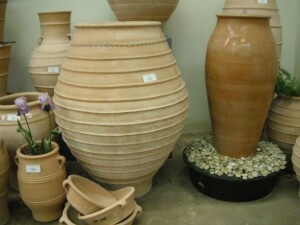 Planter shapes, can determine the how, why and what to use for plants. 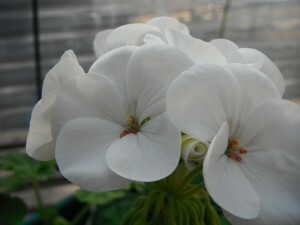 Pale colors in the center back, and bright colors on the rims highlight the color and form of the plants in the front. Pale colors work to bringing darker colors placed in front of them to life. Drive by large bed and notice the colors at 50 MPH it’s the light in the back and the dark in the front that stand out. location,dwarf Crape Myrtles perform beautifully in full sun with lots of air movement, Dogwoods, and Sumacs, under shade structures, Wax Myrltes and Yaupon Hollies, in full sun, with plenty of irrigation, we like the bark even in winter adds interest. It’s Texas with hot sun, some locations can be like and oven and bake the roots. We’ve tested soils well over 150+/- degress. That’s a place for the Agave! Agaves, Grasses and Yuccas love the full sun, and typically won’t need supplemental irrigation. Great for those hard to reach places or non-irrigated locations. Pots in high pedestrian areas should sit well back from the street, not impede traffic or the windows of a business. Forsythia is common in in the spring, invasive and a highly visible plant, perfect for a container arrangement. A centerpiece provides the scale and a visual, but, with nothing but a barbed wire fence between the Canadian and Texas unless protected from the wind, it should be one tough centerpiece or it quickly becomes a ½ center piece. A pot of Daffodils, Iris, or Tulips in the center can be switched out for fresh when the flowers fade; annuals like Dusty Miller, Pansy, and and Violas will grow in the late winter until about mid-March. Pair with a small boxwood or Juniper for height. Small pots for tabletops and étagères on the patio should be well shaded to protect from the sun, watered daily or use succulents. 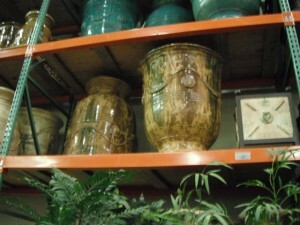 To appreciate the look of small pots place at or close to eye level. So, we plant small pots with plants that are easy to grow, without much concern for watering or care, sun lovers, a word of caution, small pots in the Texas sun is sure death even to sun loving plants, part sun, part shade is advised. Aloe, Sedum, Hens and Chicks and other succulents fit the bill, when we have flowers left over and can’t fit one more into the bed, we pop into pots. They look nice up close. Small pots, we’ll use anything for planting; boxes, old cans, coffee cups, a great place for containers without drainage (planter gifts from a florist), use with succulents and be sure to empty after a rain. In terms of container shape, doesn’t matter whether it’s a modern corten metal planter, or a classic cast iron urn; the pottery is as much a part of the planting as the plants themselves. BKL shop is located in an industrial area, plenty of men who work physically demanding jobs in this area, will wave to us while on their drive to or from work just to tell us the plants look great!